This blog is used to share information with alumni, students and friends of the UW Madison Real Estate and Urban Land Economics Program. This past Thursday, February 23rd, the Real Estate Club invited Heather Stouder, Madison’s Director of Urban Planning, Rick Gilbertson, Partner at Strang Architects, and John Feller, Project Manager at Findorff Construction, to come speak. 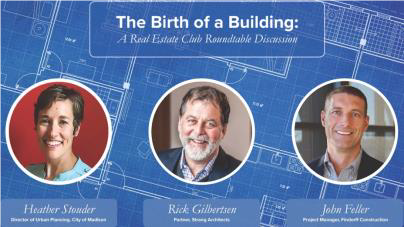 The meeting, dubbed “The Birth of a Building,” was intended to expose Real Estate Club members to the important characters who they’ll have to work with throughout their careers, especially if they pursue a career in real estate development. Hosted at the beautiful Pyle Center, tons of students came early to enjoy pizza, beer, and the company of their peers. Undergraduates and graduates mingled with each other and the speakers, before the meeting finally got underway. Co-Presidents Emmet Gaffney (BBA ’18) and Ben Stevens (MBA ’17) began by updating the club about the Seattle Club Trip, the first annual “Pro Form-Off” competition, and a day trip to Milwaukee they’ve began to organize. After introductions, each panelist gave a 20-minute presentation about their unique role in the development process, highlighting some of the marquee deals or projects they’ve worked on in their career. Interestingly, all three of them recently collaborated on the construction of The Spark, a partial block revitalization effort in the Capitol East district of town. Each speaker delivered an engaging presentation that captivated the attention of all attendees. After presentations came a brief Q&A session. The next meeting will be on March 30th and will feature Martin Ditto, President and CEO of Washington DC-based development firm Ditto Residential. Please don’t hesitate to reach out to Emmet Gaffney (ejgaffney@wisc.edu) or Ben Stevens (bstevens6@wisc.edu) with any questions about the club! The Real Estate Club kicked off the semester with the first meeting last Thursday, January 26th at the Pyle Center. The meeting was the latest installation of the Innovator Award Series, an annual award recognizing individuals who have made lasting impacts on the industry while embodying the rich Wisconsin real estate tradition. This year’s award was given to Richard Saltzman, CEO and President of Colony Northstar. A special thanks to Michael Brennan, executive director of the Graaskamp Center, for helping coordinate the event, as well as Walker & Dunlop who has made the award possible through a generous donation. The turnout was tremendous; over 150 students piled into the Pyle Center to hear Mr. Saltzman speak. Pizza, beer, and hearty conversation flowed aplenty during the pre-meeting happy hour. The club presidents, Emmet Gaffney (BBA ’18) and Ben Stevens (MBA ’17), began the meeting by informing the club about the exciting events upcoming this semester, including a trip to Seattle, the first annual REC “Pro Form-Off,” and future club speakers, among other things. After a warm introduction from Michael Brennan, Mr. Saltzman took to the stage and began his presentation. A real estate investment banker at Merrill Lynch for 24 years, Mr. Saltzman helped to revolutionize the way real estate investment companies access capital. During his Merrill Lynch tenure, Mr. Saltzman was also responsible for various real estate-related principal investments, including the Zell/Merrill Lynch series of funds which acquired more than $3 billion of commercial real estate assets. The next club meeting is February 23rd and will be featuring a local architect, the chief urban planner in Madison, and a local developer. Please don’t hesitate to reach out to Emmet Gaffney (ejgaffney@wisc.edu) or Ben Stevens (bstevens6@wisc.edu) with any questions about the club!